Using a spreadsheet program such as Excel, open the file DeRisiGodList.xls. The file is in tab delimited text format. 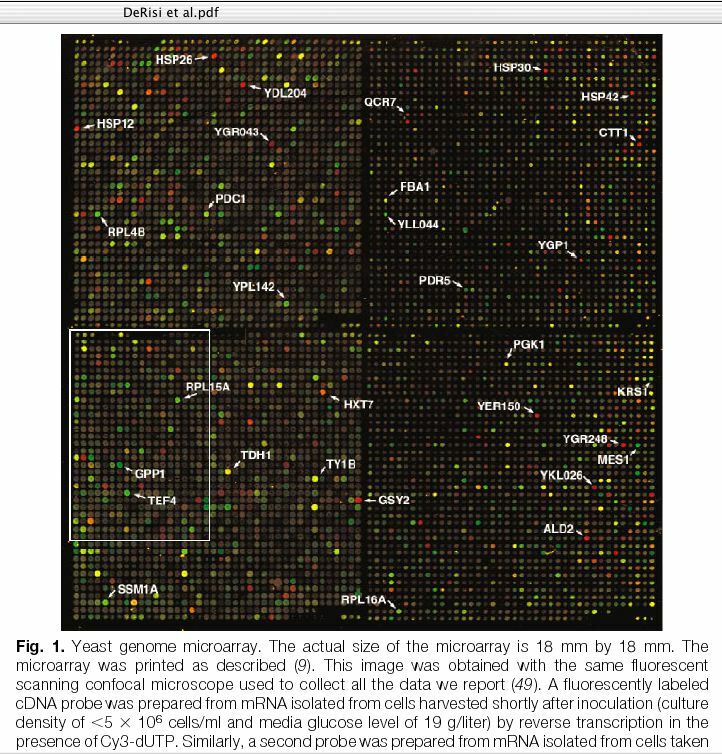 It is the "godlist" associated with the DeRisi tiff files, describing where each gene is spotted on the microarray. Open this jpeg snapshot of the file 1309_ch1_OD690_green.tif, the results of scanning one of the microarrays in the Cy3 channel. To use the godlist in MAGIC Tool, the spots must be listed systematically, first by grid, and by rows and columns within each grid. Using the Excel sorting function, modify the godlist so that the genes are listed in order of spot number. Note that this results in the grids, rows and columns being ordered sequentially. To determine the grid order (which is grid 1, 2, 3 and 4), and whether the spots are numbered left to right or right to left horizontally, and whether the spots are numbered top to bottom or bottom to top vertically, we can use the godlist in conjunction with Figure 1 of the paper. For example, find YDL204 in Figure 1, and read its sector, row and column numbers. Use other ORF names (i.e. 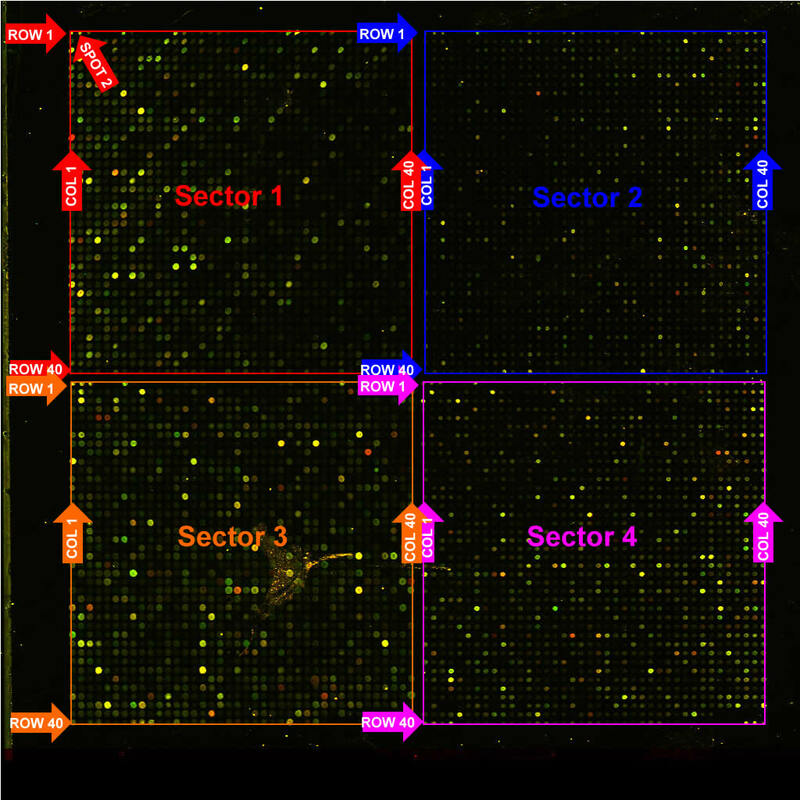 names that begin with Y) in Figure 1 to determine which is grid 2, and which is grid 4. 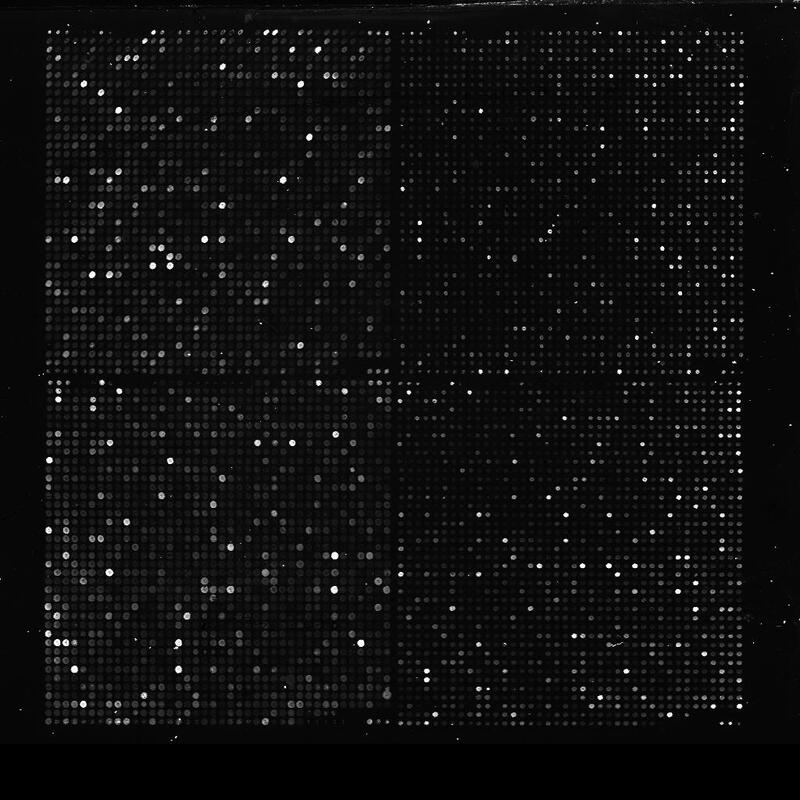 Check your understanding of the godlist, and how it relates to the microarray image, by looking at the following Jpeg graphic of the array orientation. The gene list for MAGIC Tool will be created from the original godlist, which you should still have open in Excel, with the data sorted by spot number. This systematic ordering of genes is the first criterion for a MAGIC Tool gene list. A second requirement for the MAGIC Tool gene list is that the ORF names must appear in the first column. Using Excel, modify the godlist to meet this second criterion. The final requirement for the MAGIC Tool gene list is that there must not be any column headings. Modify the godlist to meet this third criterion. Save the modified godlist, now a MAGIC Tool gene list, as a tab-delimited text file, calling it derisi_genelist.txt. Continue to Creating the Project.